When a product becomes a household name, a lot of people tend to stake their claim. Origin stories are lost and rewritten. Ownership changes hands. Debate ensues. Which is partly why Michael Boehm was happy to appear on "Million Dollar Geniuses, "the new History Channel show about “ordinary people who transformed their ideas into wildly successful products.” Boehm knows a little something about extraordinary. In 1994, the lifelong creative came up with the concept of the George Foreman Grill -- now one of the bestselling infomercial products of all time. Needless to say, Boehm enjoyed the opportunity to clarify a few things, as well as share never-before-seen sketches and drawings. For a while, he said, he carried a copy of his patent with him because so many people doubted he had really invented the grill. “Well yes, I did do that, I’d tell them,” he said. I was lucky enough to interview him in advance the episode airing. First, I wanted to know: How did he approach prototyping? So, he kept refining. At the time, he was general manager of Tsann Kuen USA, a Chinese home electronics manufacturer. Tsann Kuen became the first manufacturer of what was then named the Short Order Grill. When Boehm began pitching it to potential buyers, he keyed in on two major benefits: That the product resulted in great tasting food without grease or fat. At first, he relied on his contacts in the housewares industry. Eventually he had the inspired idea to send a sample to a marketing expert he knew who worked with George Foreman. At the time, Foreman was endorsing mufflers. Boehm wanted to know: Was Foreman interested in endorsing another product? He mailed his sell sheet and tooled prototype after getting the go ahead the next day. In addition to filing a patent, Boehm thought about how to protect his ownership of the idea strategically. “Rather than try to protect myself, I thought, I’m going to try to knock myself off.” I cannot recommend this strategy enough. Thinking about how to outwit your competition is crucial. Boehm always analyzes his ideas from a line standpoint. 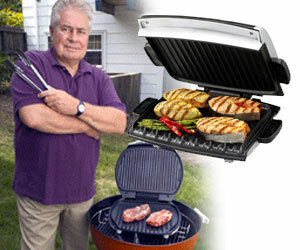 He had three or four models of the grill in mind. So he started developing the very smallest one first, which minimized his investment and maximized container loads, ultimately resulting in a stronger cost structure. If the product was successful, he reasoned, he could introduce a larger size in a few months. If not, he would cut his losses. There would be questions at the beginning, he anticipated. He was ready to take consumers’ requests for additional features into consideration. Smart. The grill is far from Boehm’s only idea. How does he know when he’s got a winner on his hands? He asks basic questions, he said. “Is it the right size? Is the right material? Does it have the right structure? What about promoting it? Are there line extension possibilities? You have to satisfy yourself first before going after others.” And even then, people might not hear you at first. Be able to make mid-course corrections. Test early. Test quickly. Boehm’s episode is scheduled to air April 29 on the History Channel.